When we first started mapping out our itinerary for Switzerland we planned to spend time in both Interlaken and Zermatt. Both destinations have a lot of similarities to Whistler BC (one of our favourite places on the planet), surrounded by rugged snow-capped mountains and loaded with outdoor adventure. We had visions of challenging hikes to jagged peaks followed by whitewater rafting and mountain biking. Then we snapped out of it and heard Baby B crying for attention. This trip to Europe was going to be different. We now have to consider Baby B’s needs and his daily routines. Long hikes and rafting trips need to be put on hold for the next year or two, so we continued our research and looked for a Plan B – a destination that would deliver the natural beauty that we had come to associate with Switzerland, yet offering “stroller friendly” activities and sightseeing opportunities. So we “settled” on Luzern as an alternative. I use the word “settled” because we were somewhat bummed that both Interlaken and Zermatt were getting scratched from our itinerary. It had nothing to do with Luzern as a destination, it was just that we had heard such great things about Interlaken and Zermatt. We were traveling with our Rail Europe train pass, so we wanted a location that was centrally located and well connected by train. Luzern appeared to be a good fit and was less than an hour away from Zurich (did you see our photos from Zurich?). So we made our train reservations, booked our hotel and began researching the next city on our trip (Strasbourg, France). We didn’t give it any more thought after that – until we found ourselves on the train from Zurich to Luzern. 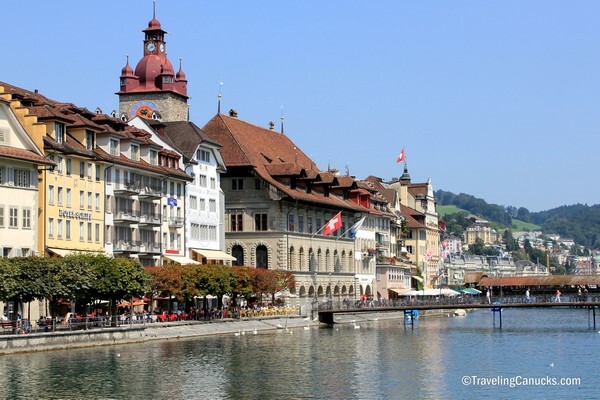 We realized that we knew very little about the city – had we made the right decision to skip Interlaken and/or Zermatt for Luzern? I think it took us about 5 minutes to fall in love with Luzern. It may have been sooner, but we were pretty focused on finding our hotel and didn’t notice our surroundings until we reached the infamous stone tower and wooden bridge. It has everything we look for in a European city – historical architecture, outdoor restaurants, cobblestone roads, red roofs, fresh flowers hanging from windows and pointy cathedrals that dominate the skyline. We love surprises! Our attraction to Luzern began when we witnessed its stunning architecture and colourful murals. As we wandered through the tight pedestrianized streets we couldn’t help but admire its creativity. The Old City is a living and breathing outdoor art museum! The plan for our trip to Luzern was to reach the peak of Pilatus (more on that later), wander the streets and check out the sites, sample locally crafted beer and enjoy traditional Swiss food. 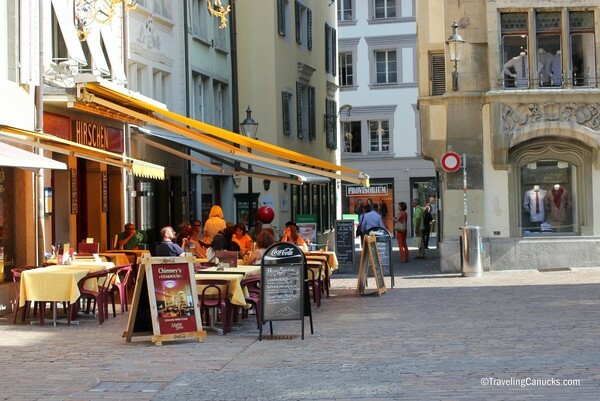 Like most cities in Europe, Luzern is filled with outdoor restaurants that spill onto cobblestone streets. We can’t think of a better place to spend an afternoon! 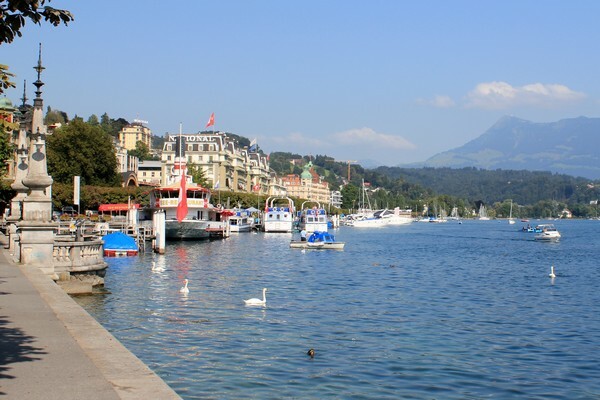 That said, budget travelers beware – Luzern is not cheap. To put food and drink prices into perspective, we’ll share the results from our typical “Big Mac” and “Beer” tests. We always use beer and Big Mac’s to compare the prices of a travel destination – it’s not exactly scientific but it works! A 50 cl beer was approximately 8-10 Swiss Francs, equivalent to about $9-11 CDN. A Big Mac combo was 14 Swiss Francs, which is equivalent to approximately $15 CDN. So, a Big Mac combo followed by a beer will set you back about $25 CDN. Now, we are not suggesting that you eat at McDonald’s, far from it. After all, you didn’t travel all the way to Luzern to eat crappy food when there are so many wonderful restaurants to choose from. Just budget accordingly and the prices won’t sting as much. We loved the variety of restaurants that line the Reuss River in the Old Town. Initially we were surprised by all of Italian restaurants in Luzern, but then we realized how close Luzern is to northern Italy. I think we just assumed that Swiss cuisine was identical to German cuisine (there are certainly similarities, but we also noticed a heavy Italian and French influence). We weren’t complaining though, we LOVE Italian food. We enjoyed a fantastic baked cannelloni with smoked salmon, spinach and cream cheese while catching some sun on a riverfront patio. Delivery service by horse carriage? We’re definitely not in Canada anymore! The iconic Chapel Bridge (Kapellbrücke) with its stone water tower (Wasserturm). 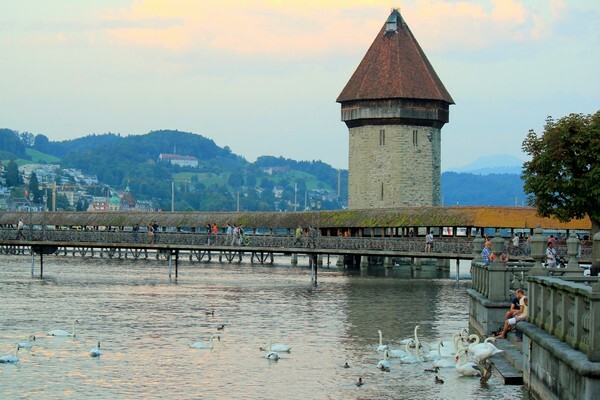 Originally built in 1333 as part of Lucerne’s fortifications, it is the oldest wooden covered bridge in Europe and is the oldest surviving truss bridge in the world. It’s without question the most photographed and top tourist attraction in Luzern. Have you visited Switzerland? What was your highlight? Share your experience and travel tips in the comments section below! Wow what a nice city! Love the murals too. And yes Switzerland is expensive! I was in Geneve and Zurich and did the occasional McDonalds as much as I hate to do just to save some money…was the only thing I didn’t like about Switzerland. It’s a beautiful city. We had a great time in Luzern and can see ourselves returning one day. Agreed – prices are high, but a couple days is certainly doable! We were just in Lucerne last week. I loved the city, the scenery, the architechture, but the prices of everything were outrageous. We spent $30 on two coffees and two pastries…come on. Then we ate dinner at the Brauerei by the water and it was terrible food and service for another absurd price. I want to love Lucerne but because of the bad value for everything, it’s not my favorite city! The prices of Switzerland seem to be a common complaint by travelers. We also ate at the Brauerei on the river but our experience was different – we had great service and the beer was delicious (but the bill was steep). I guess it really comes down to expectations. We just paid with our credit card and didn’t think about. I have never considered Switzerland but this looks totally different to how I imagined it. Quite appealing really. We felt the same way. I know it’s silly to say, but we didn’t expect it to be so “European”. We just assumed jagged peaks and lakes. I’ll be there in July next year. I’m already saving but by the sound of it I’ll have to make more of an effort to pinch my pennies between now & then. Your photos are stunning. I can’t wait to get there & take some of my own. I’ve only heard good things about Luzern. It looks and sounds like a beautiful place! It quickly became one of our favourite European cities. I just visited Switzerland for the first time a few months ago and was so pleasantly surprised! Found it be so lovely. Your pics really took me back! Ooo, it looks lovely! And it looks like you had nice weather, too. Don’t you just love it when a place really takes you by surprise and you end up loving it?? That’s one of my favorite things to have happen when traveling. Yes! It really is the best part about travel! 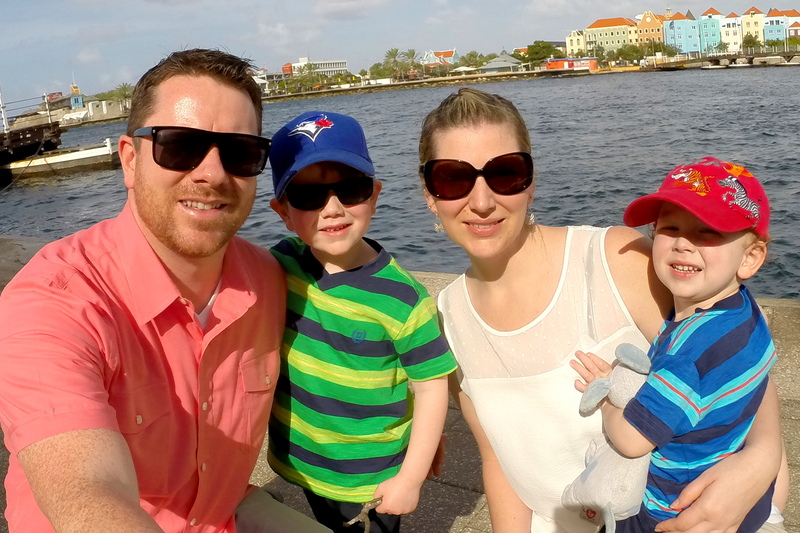 And yes, we lucked out with the weather… although it was super hot, but we rarely complain about the heat – we are Canadian after all! Yes, the lake cruises are a must. We did the lake tour plus trip to the peak of Mount Pilatus. A fun way to spend the day! Awesome photos team! All the best on your travels through Europe. LOVE Luzern. I was there back in ’06, and I absolutely fell in love with that little town. So glad I got to see this again this morning! Thanks! We’re happy this post brought back some fond memories! I love these quaint European towns. Those photos make it look so peaceful and relaxing. I’ve only been to Geneva in Switzerland, but you’ve inspired me to go back! Awesome! We’re glad these photos have inspired a return visit. We have not been to Geneva but we’ve heard wonderful things. Alas, I have only seen Switzerland from the inside of a train (on a Eurail pass no less), but it did look stunning. I was surprised too after seeing your photos. The city looks amazing especially the views near the river. I want to stroll around and simply be transported to a new beautiful place. Thanks for sharing these! Happy to stumble upon this post! I just got back from a long weekend in Zurich and Luzern. My cousin has been living in the area so she took me sightseeing. I also was surprised by this area and had a great time enjoying the mountainous scenery, beautiful architecture and the clear waters. Wonderful photos too! what beautiful photos – and stunning colors. you were there on the PERFECT day! Switzerland is one of my favourites countries in Europe actually! Great pictures. One of my lifetime dreams was to visit Switzerland. The dream became a reality when I visited Switzerland with my family in 2010. We thoroughly enjoyed every moment of our trip. We visited the Swiss Alps, Lucerne , Jungfrau, Titlis, Rhine Falls, and Kleine Sheidegg. We were totally mesmerized by the beauty, the cleanliness and the serenity of the place. If there is a heaven on earth, for sure it must be Switzerland.